This guide explains the installation and configuration of a Samba server on Ubuntu 16.04 (Xenial Xerus) with anonymous and secured Samba shares. Samba is an Open Source/Free Software suite that provides seamless file and print services to SMB/CIFS clients. Samba is freely available, unlike other SMB/CIFS implementations, and allows for interoperability between Linux/Unix servers and Windows-based clients. If you don't have an Ubuntu server already, follow this tutorial to get a minimal server setup as the basis for this tutorial. Your Windows machine must be in the same Workstation domain as the Ubuntu server, i.e. WORKGROUP in my case. on the shell of your Linux server to become the root user. Samba is available in the Ubuntu repositories. 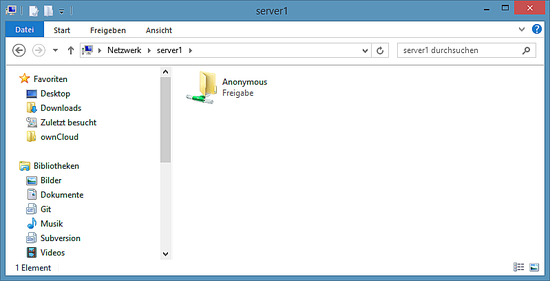 The first step is to install the Samba Server and its dependencies with apt. It will install the Samba version 4.3.9-Ubuntu. And add the following lines. 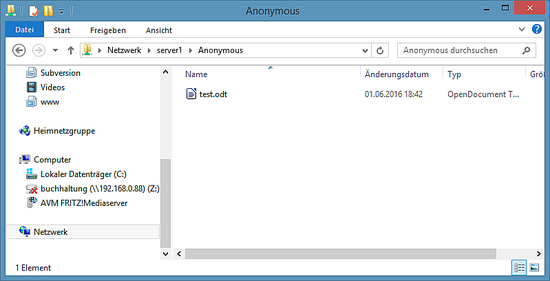 Then I'll create a directory for the anonymous share. And restart Samba to apply the new configuration. 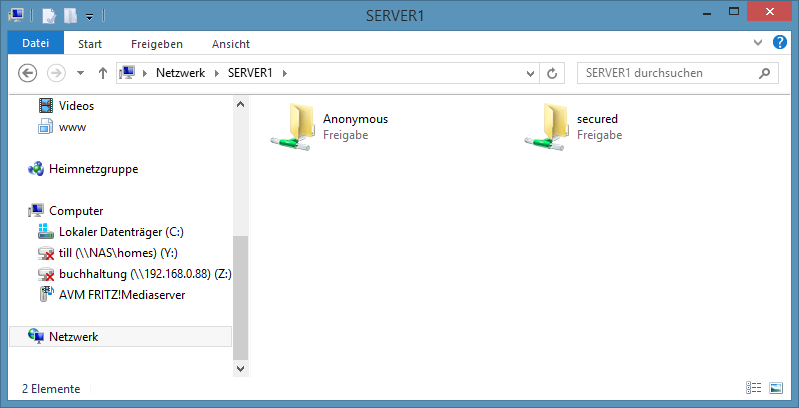 Now you can access the Ubuntu sharing in Windows by entering "\\server1" in the windows search field of the menu or use the network browser of the Windows file explorer to connect to the share. Try to upload a file by Drag&Drop to the share to see if it is working correctly. You can cross check the content at server also. drwxrwxr-x 2 nobody nogroup 4096 Jun 1 18:46 .
drwxr-xr-x 3 root root 4096 Jun 1 18:39 ..
For the password-protected share, I will create a group smbgrp and user till to access the Samba server. I'll use "howtoforge" as password in this example, please choose a custom and secure password on your server. 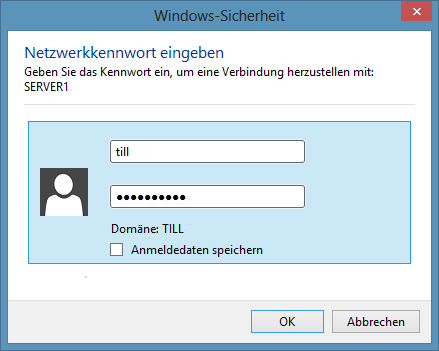 At the Windows machine, open the "\\server1" network device again, it will request a username and password now. Enter the user details that you created above. In my case, the values were user=till and password=howtoforge. drwxrwx--- 2 root smbgrp 4096 Jun 1 19:25 .
drwxr-xr-x 4 root root 4096 Jun 1 18:49 .. The IP of the VM is 192.168.1.100, it can be changed in the file /etc/network/interfaces. Please change all the above passwords to secure the virtual machine. How I upgrade Samba after Instalation? this will install Samba updates as well as all other system updates. How to create a common share? i noticed you installed the system-config-samba which i believe it is the gui utility for samba. i did the same but gui keep crashng. any idea? 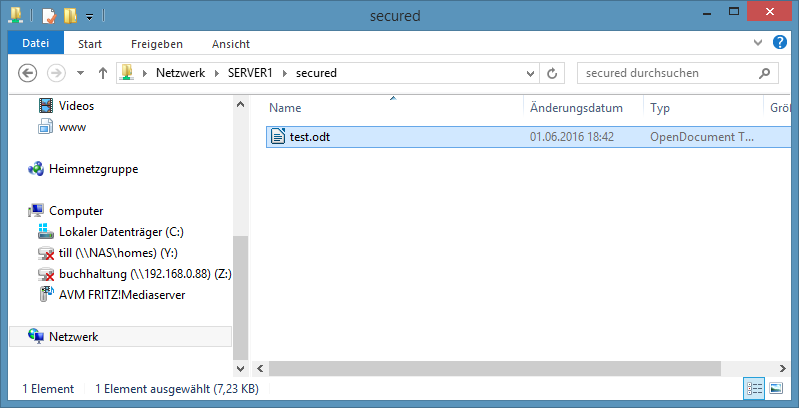 after deploying the setup i can share the directory but the folder is not accessible in windows(shows folder). It says "you might not have permissions to use this network"
Awesome writeup, pitty you are a rare bread amongst linux users, meaning this is the best guide to SAMBA by a long way!!! What is the purpose of creating "smbgrp" if the samba installation already creates the group "sambashare"? Why not just use that existing group? Thanky ou for your report. I just installed the tutorial again to verify it and there are no issues in the tutorial, all commands are working and it results in a fully working samba server. If a command does not return anything on Linux then it means that it worked, if it would not have worked then you would have gotten an error message, so the commands you posted are working file and they did exactly what they should (make a copy of the configuration file and create a new empty file. "This command did not work at all, (notepad C:\\Windows\System32\drivers\etc\hosts)"
File editors in windows need to be run as Administrator to access/edit the hosts file. Rightclick on the notepad icon, then click on "Run as Administrator". 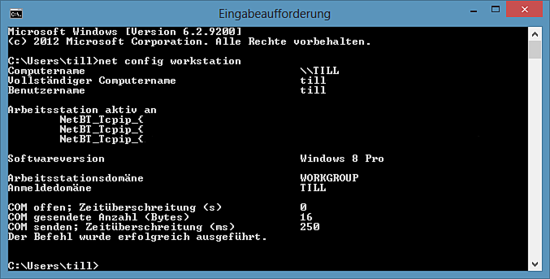 Then click on file/open and enter "C:\\Windows\System32\drivers\etc\hosts" should now work. On Windows 10 you can even press right mousebutton over the startmenu and choose Windows Powershell (Admin) and write the command to there. First, thank you for the guide. It is very usefull. But I have a problem, I created the secure samba server. But in windows when I try to use it, windows gives me an error. "Multiple connections to a server or shared resource by the same user, using more than one user name are not allowed. Disconnect all previous connections to the server or shared resource and try again." Yo tenía Ubuntu 14.04 como servidor y a él se conectan equipos linux con Samba, desde que actualicé a 16.04 estuve viernes 29 Jul, sábado 30 Jul y Lunes 01 Ago. No sé qué fue lo que quedó mal con la configuración porque ya no pude más acceder a las carpetas y ni a las impresoras de Linux desde Windows. Intenté un montón de configuraciones de versiones anteriores de Ubuntu y ninguna me funcionó. ya que al principio probé con nobody, podía accesar a carpetas y archivos pero no grabar. Solo me queda reconfigurar las impresoras que aún lo tengo pendiente, por ahora la impresora la tengo instalada en modo compartida en un equipo con Windows, a ver si pueden escribir un pequeño manual para saber cómo configurarlas. Además, la manera de restringir a usuarios a ciertas carpetas es la parte que también explican aqui pero que aun no lo he probado. Quiero comentar también que en Linux soy novato y esta explicación fue muy entendible a comparación de otros que encontré ne la web. Por alguna razón de un día para otro, me volvió a dar problemas de conexión. Lo que haré ahora es hacer una instalación limpia de Ubuntu 16.04 y a ver si con eso se resuelve, porque lo que hice fue hacer actualización desde versión 14.04 a ésta nueva versión. Ya les estaré contando, saludos. El problema que encontré es que se desconecta del wifi sin razón alguna y no la configuración de Samba, al parecer es del mismo administrador del wifi de Ubuntu. De ser posible, hacerlo varias veces hasta que se vuelva a reconectar. A mí, del todo no me conviene ya que tengo un sistema en red y a mis compañeros que se conectan a ella, a cada rato los "bota" del sistema. Espero y se resuelva pronto esto por parte del equipo de Ubuntu o de plano instalar una versión anterior. after installing samba in anonymous configuration one major difficulty occured: I was able to create a subfolder from my Windows 10 desktop, but the subfolder does not have write permission and I cannot change the permission in Windows 10. 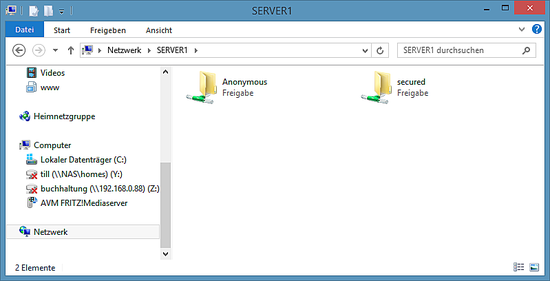 Of course I can change the permissions on the server, but that is not really a good workaraound. What did I d wrong? 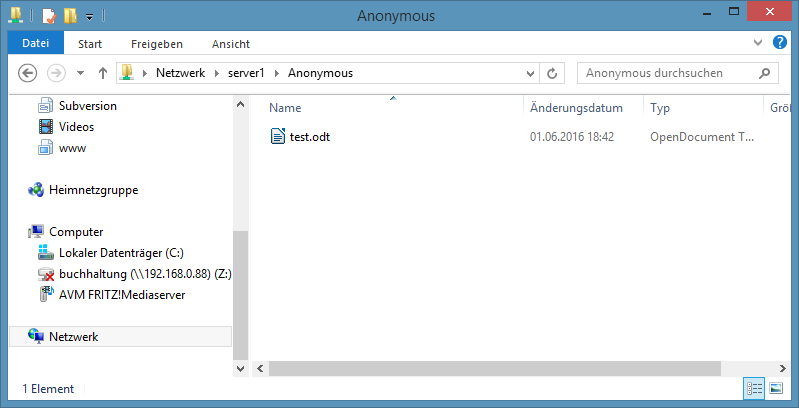 As Admin on Windows 10, I was finally able to change permissions on the Anonymous folder and all subfolders. So it works fine. Upper right corner, below the big red download icon. After trying the two gui's for configuring samba several times I waited to find time to try the manually config. With your tutorial it was that easy - why didn't I try earlier ;) Thanks! I can drag and drop stuff.. I can share directory anonymous and create folder, but when I create another sub folder inside the folder, or copying folder that contains files and sub-folders it gives me error permission. what should i do? "Now you can access the Ubuntu sharing in Windows by entering "\\server1" in the windows search field of the menu or use the network browser of the Windows file explorer to connect to the share." No I can't, Do I only have to modify the hosts file and nothing else? How do you make the network appear besides your computer on the windows explorer sidebar?? If I run \\server1 I get a path not found error. Definetly there are missing steps here. Thank you very much for your clear tutorial. I've tried several, and yours is the first one that works flawless with easy and clear steps! Thank you very much, it works like a charm just follow the steps above, working both for shared and secured!!!! Samba Server installation on Ubuntu 16.04 LTS as ready to use virtual machine image download in ovf/ova format, compatible with VMWare and Virtualbox.